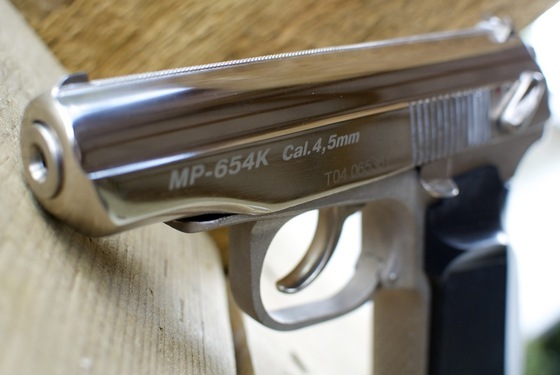 If you have not already watched my Baikal Makarov MP-654K CO2 BB Pistol Table Top Review, make sure to do so so for info on features and specifications. During this Field Test Shooting Video Review of the Baikal Makarov MP-654K, I take a look at the actual real world velocity using my Chronograph along with some accuracy testing using paper targets with a controlled shooting position. I shot 5 rounds through my Chrony Cronography and got an average fps of 306 which was not super high but just fine for plinking. 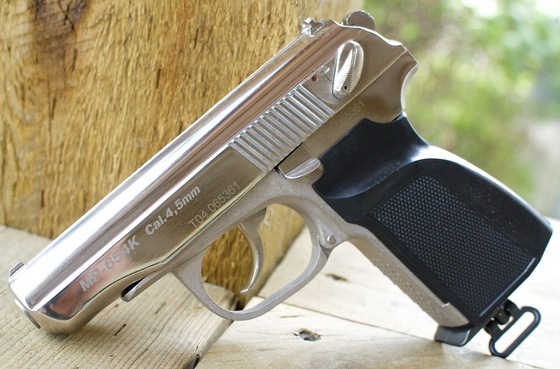 I would expect to get well over 100 shots with my Baikal MP-654K Makarov since the CO2 being released with each shot is fairly conservative. The temperature on this day was under 10 degrees Celsius. Moving on with my accuracy results from 30 feet back in a semi rested position, I was able to get a 5.5 inch goruping with 10 shots. 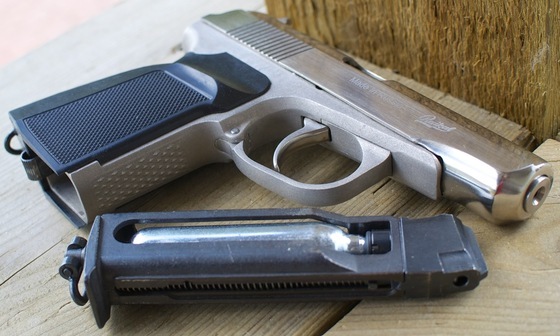 The Baikal Makarov CO2 BB Pistol does have a rifled barrel which may work better when using lead BB's but you would have to be careful not to load too many at a time since the magazine follower spring is rather heavy and could deform the softer lead BB's making them jam in the gun. 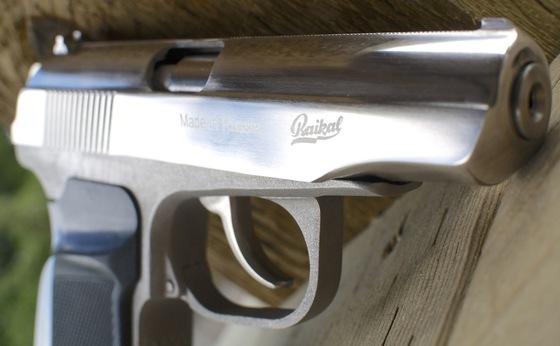 Hard Steel BB's do not deform or jam in the gun but are not optimal for rifled barrels since they do not grip the rifling very well and can give sporadic results. My grouping was also centered a bit to the right but not by too much. 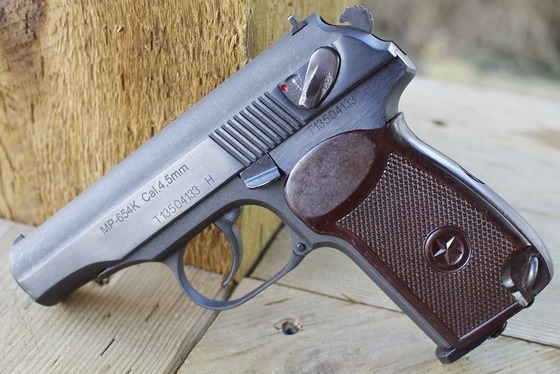 The 2013 Baikal Makarov MP-654K CO2 BB Pistol may not be the best performer I have tested in terms of velocity and accuracy but it is for sure one of the best built and most realistic BB pistols I have reviewed. Materials: Weapons grade steel slide, frame and most parts. 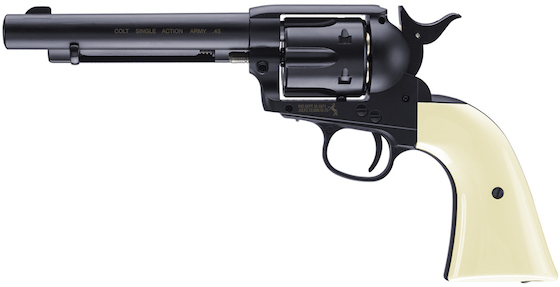 Action: Semi auto, double and single action. 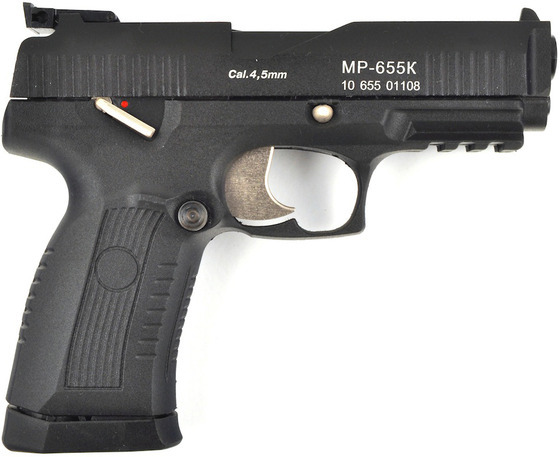 Ammunition Type: Steel/Lead BB's 4.5mm. Trigger Pull: The trigger pull on the 2013 Blued Baikal Makarov MP-654K CO2 BB Pistol is good in single action mode (When cocked), when shooting in double action mode it is a bit heavy but it seems like over time the gun is working its self in a bit as the metal is hard and as with many Russian made guns, they need some break in period. The trigger springs are heavy so don't expect light trigger pulls. Accuracy: The accuracy and true feet per second performance will be tested when I do my future Field Test Shooting review. 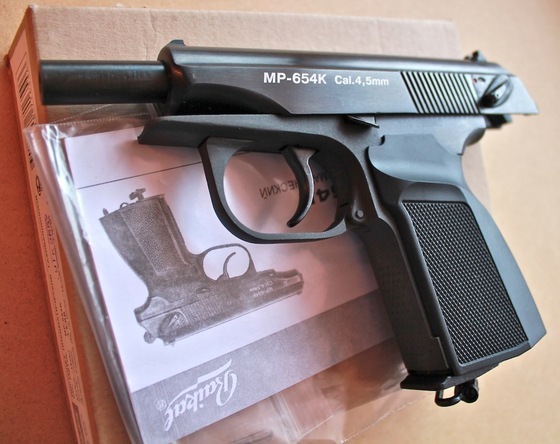 Build Quality: Excellent, the Baikal Makarov MP-654K CO2 BB Pistol is made side by side using the same machine sand same materials as the original Makarov PM (9x18) firearm that it is Replica of. There simply is not another airgun made to this quality level or that is as accurate a replica of it's real steel version. 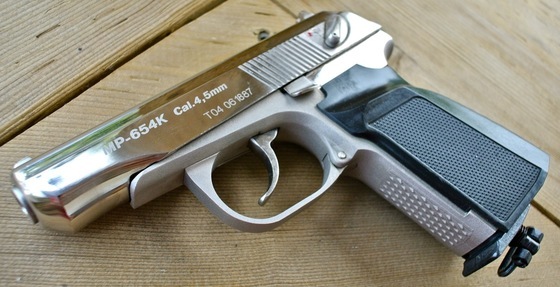 Realism: You simply can not get any closer to how close this gun resembles the original Makarov PM (9x18). You can even field strip this gun exactly like the original. 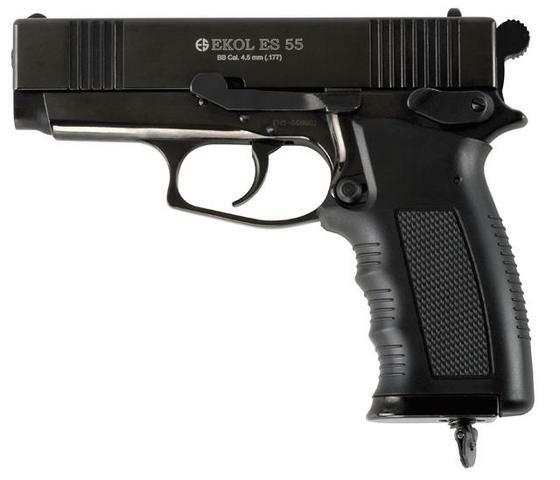 The only acceptation is when it come time to fire the BB gun version, The Baikal MP-654K is not designed to have blowback operation which is understandable as it would be impossible to fabricate this gun so close to the original and still give it blowback operation. Made side by side in the factory to the real steel version with same build quality and on same machines. 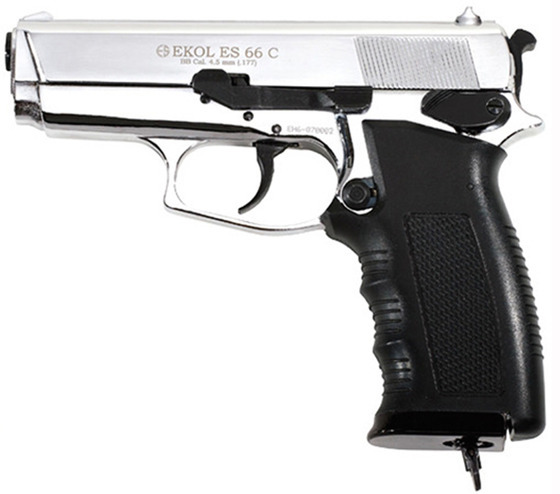 The closest BB gun to a real gun you can get in terms replicating the parts and being made out of the same materials as the real version. Can filed strip like the real version. New 2013 version has recessed barrel. New 2013 version has the flush CO2 screw. New 2013 version is the PM style with narrower handle and PM grips. Can field strip like the real version. 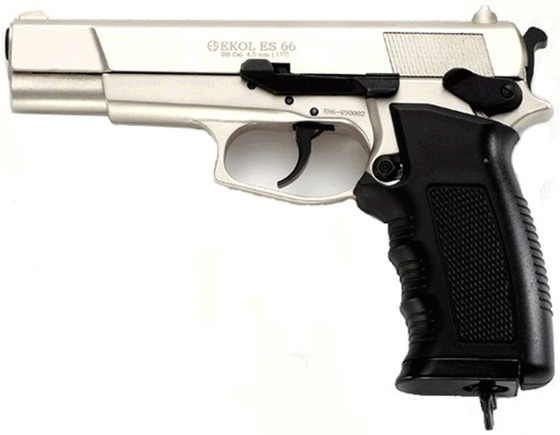 Shoots in single and double action. Safety works as a de-cocker. Expensive compared to other airguns. Only a 13 round magazine. Gun requires some breaking time. 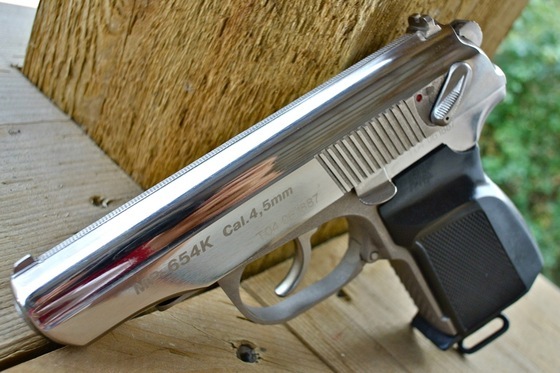 The new 2013 Blued Baikal MP-654K PM Styled BB Air pistol is one of those must have airguns if you are a collector, sure the price is a lot more than most airgun replicas out there but the 2013 Blued Baikal MP-654K is built like no other airgun. 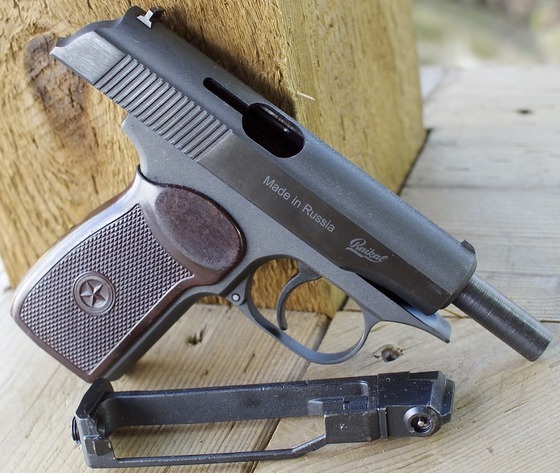 Rather than creating a replica gun around existing airgun parts, Baikal takes a different approach and reworks a real Makarov backwards so it is made to shoot steel BB's using CO2 rather than 9mm rounds. 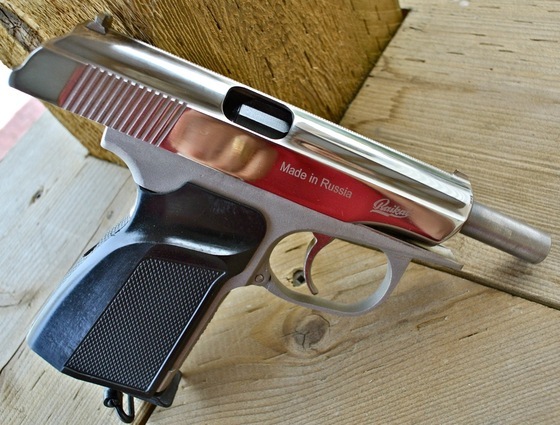 You could say it is a real Makarov but chambered to shoot steel BB's and use CO2. These guns are rarely available in Canada since they often get stuck in customs because they are so realistic. I was actually very surprised when we located a secure that had some that they where willing to give up! I am super happy to announce the return of some Airguns I reviewed a while back but up until now have been missing from our Canada Replica Airguns Store. 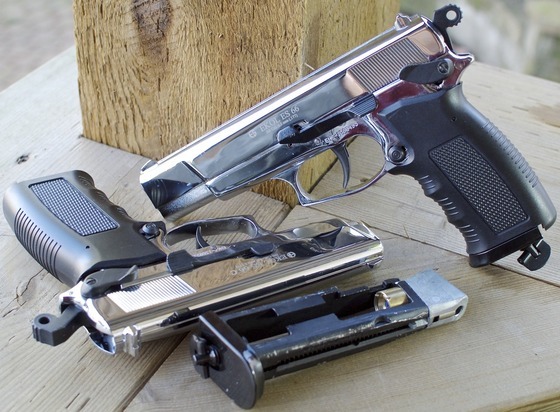 The Russian Baikal MP-654K BB Makarov, the Baikal BB-Pellet MP-655K, the Turkish EKOL ES 55 and EKOL ES 66. Check these guns out and get your hands on them before they disappear again? 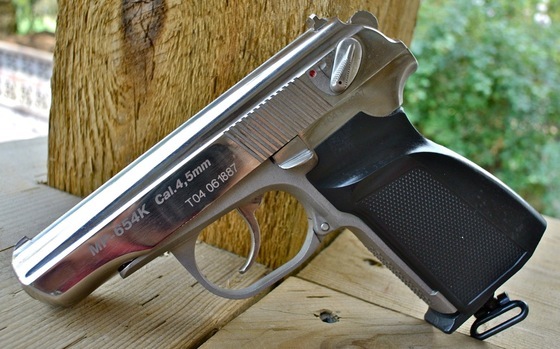 I managed to acquire another Russian made Nickel Baikal MP-654K CO2 BB Pistol, the last one that came my way was back in September of 2012 and I am really surprised I got my hands on another one to be honest so if you missed out on the last one, now is your chance! 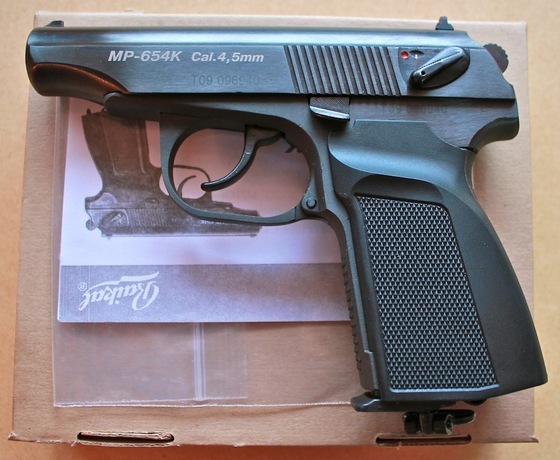 This 2004 Baikal Makarov Nickel MP-654K BB Pistol is in brand new condition and comes with the original box, manual, tools and o-rings. I have test fired it and it works great and holds CO2 with no leaks. To get in on the bidding, simply Email Me Here with your highest bid by no later than May 31st 2013 by midnight. At the conclusion of this Silent Auction I will notify the winner and they will have 24 hours to make payment before I move onto the next highest bidder. This Rare Airgun Silent Auction is open to both my Canada and US customers, Canadian Customers will pay an additional $17.99 for Shipping/Handling plus their local provincial sales Tax. US Customers will pay $29.99 International Canada to US Shipping & Handling but will not pay any sales tax. Good luck to everyone! For all those people who keep emailing asking me to sell my prized Russian made Nickel Baikal MP-654K CO2 BB Pistol, now is your chance. No I'm not selling mine but I managed to acquire another exact same version, both are made in 2004 and are very closely made in production based on their serial numbers. To be honest the new one I just received is actually a bit nicer than mine, the polishing work on the Nickel is nicer! Perhaps I have grown attached to mine and it has sentimental value so I am keeping mine even though perhaps it is not as nice as the one up for action. 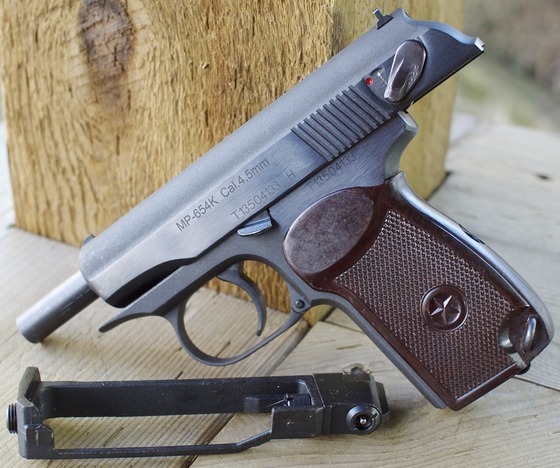 Either way, some lucky person is going to own a very rare Nickel Baikal Makarov MP-654K BB pistol very shortly! To get in on the bidding, simply Email Me Here with your highest bid by no later than September 26th at midnight. At the conclusion of this Silent Auction I will notify the winner. 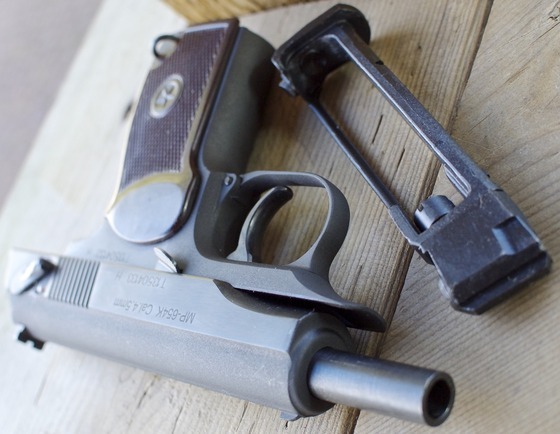 Below are some photos for you to drool over of the actual Nickel Makarov MP-654K up for bis and also make sure to watch all my video on this very fine and rare BB pistol. 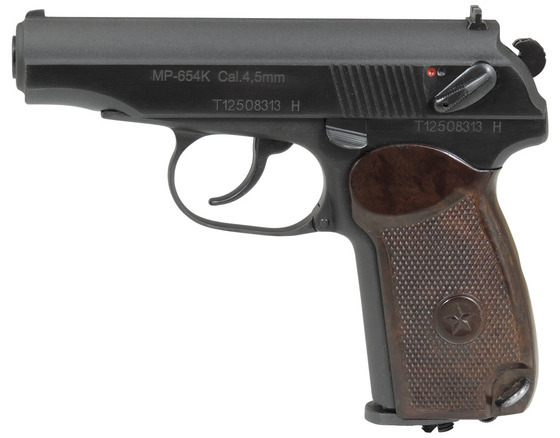 This YouTube Video is mainly a side by side comparison of two Baikal (IZH) MP-654K Makarov Replica BB Guns. One is in nickel made in 2004, and the other is blued, made in 2009. 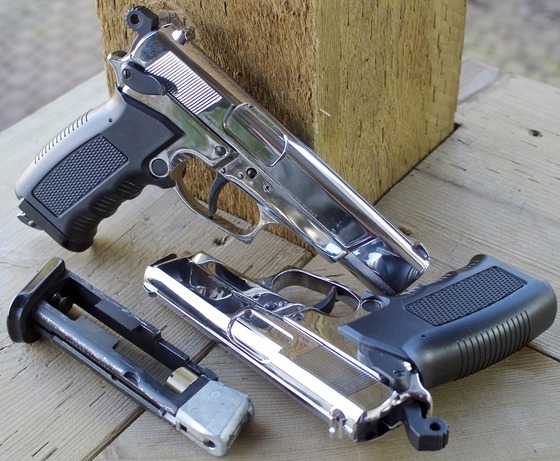 There are a some minor differences in the manufacturing of these two four year apart BB guns but essentially they're both fine examples of quality air pistols that literally are made side by side in the factory from most of the same parts as the original 9x18 Makarov. 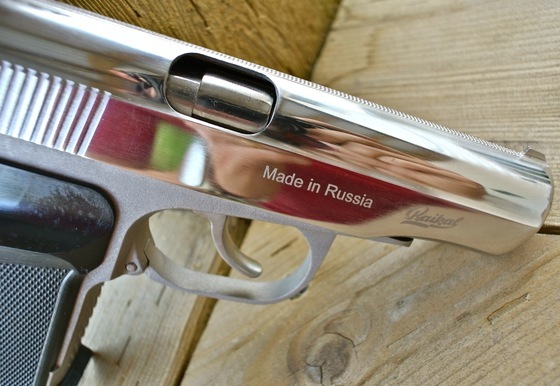 Because they are so close to the real Makarov, they have become very difficult to import into North America. 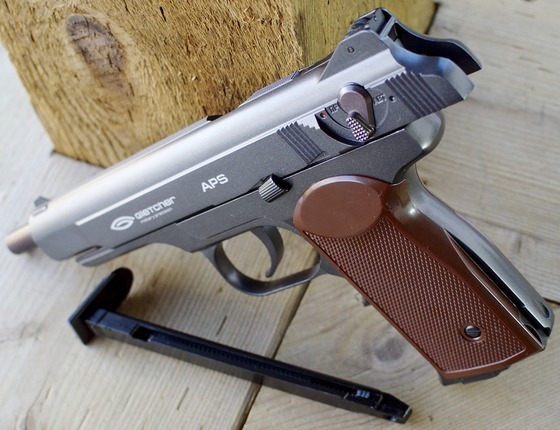 Here at the Replica Airguns Store we get our hands on them from time to time so make sure to check and see if you can snag yourself one! I already have a nickel version of the Baikal Makarov MP-654K 4.5mm CO2 BB Gun, but I got my hands on a brand new blued Baikal Makarov for comparison. 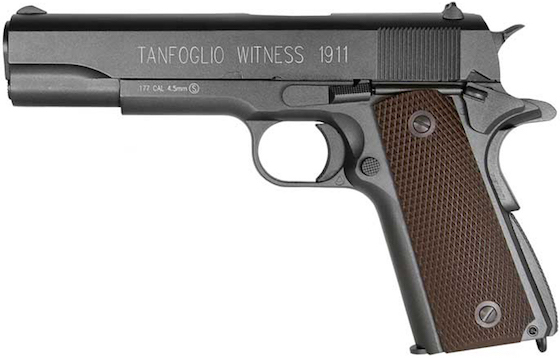 The blued version I have is the same as the one we sell in our Replica Airguns Store, that is when we have stock! They are very hard to get ahold of new or used. I wanted to do a quick video of both versions side by side so you can see any differences for yourself. 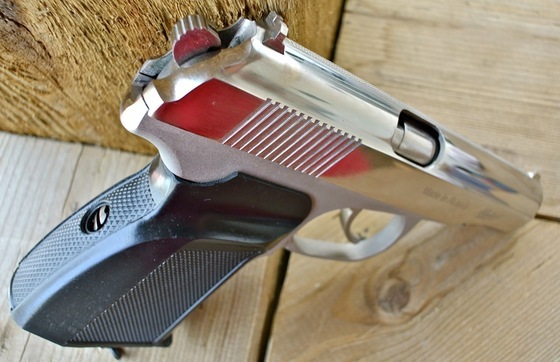 Baikal has made a few changes to the BB Makarov (often refereed to as the Air Mak) over the years, but for the most part they are still the same great gun. 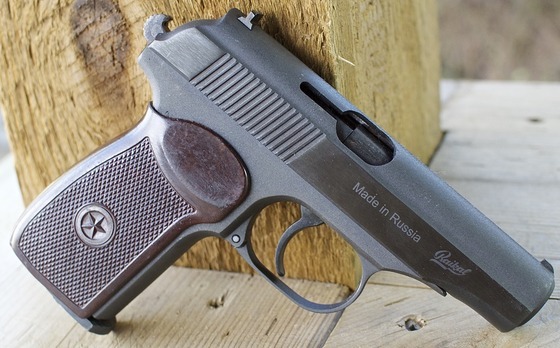 The Baikal Air-Mak is more or less a real Makarov that happens to shoot BB's instead of 9mm bullets. 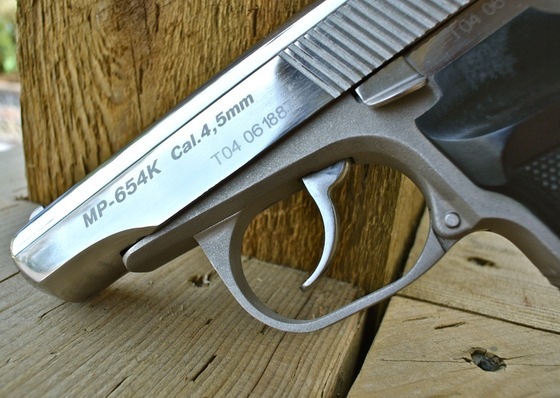 I will be following this post up with a YouTube comparison video between my 2004 Nickel Baikal Makarov and this 2009 Blued MP-654K Makarov. Materials: Weapons grade metal slide & frame. Ammunition Type: Steel/Lead BBs 4.5mm. Trigger Pull: The trigger pull is good in single action mode (When cocked), when shooting in double action mode it is a bit heavy but it seems like over time the gun is working its self in a bit. Accuracy: Good, not amazing but pretty good. 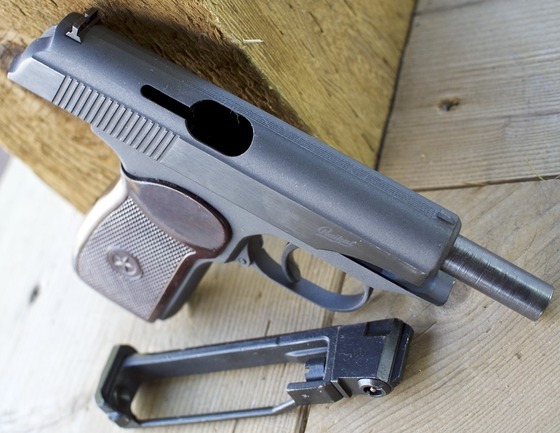 Build Quality: Excellent, this gun is made side by side with the original Makarov PMM (9x18) firearm that it is Replica of and uses most of the same parts with some modifications to make the BB version shoot 4.5mm BB's. 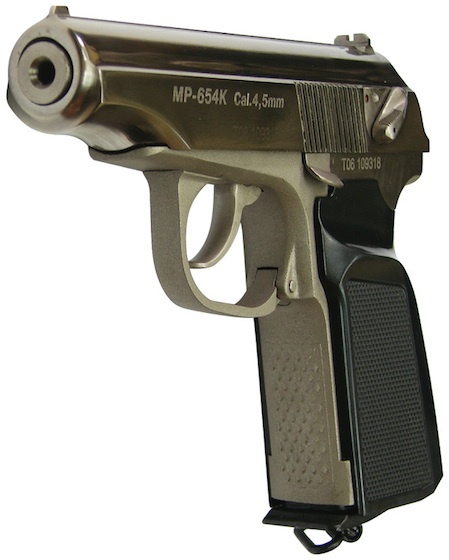 Realism: You simply can not get any closer to how close this gun resembles the original Makarov PMM (9x18). You can even field strip this gun exactly like the original. 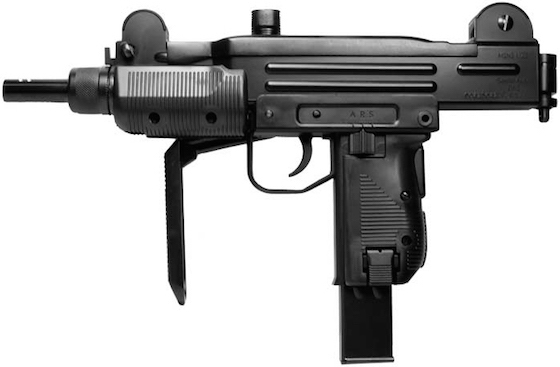 The only acceptation is when it come time to fire the BB gun version, The Baikal MP-654K is not designed to have blowback operation which is understandable as it would be impossible to fabricate this gun form the original and still give it blowback operation. 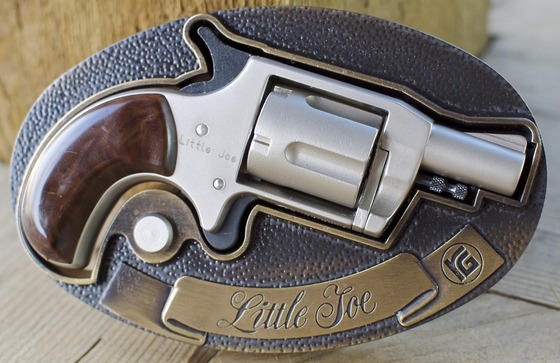 Purchased From: Private Air Gun collector. 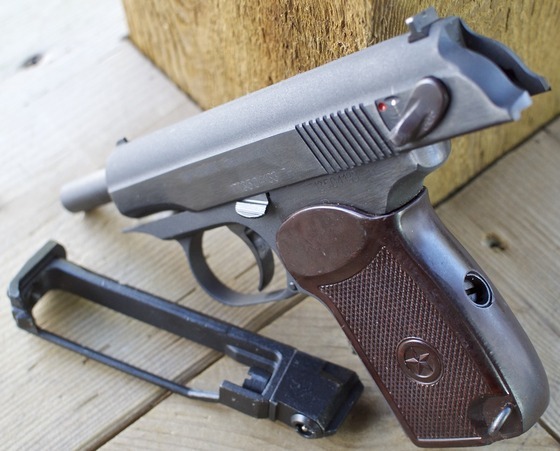 Amazing reproduction of the original Makarov PMM (9x18). 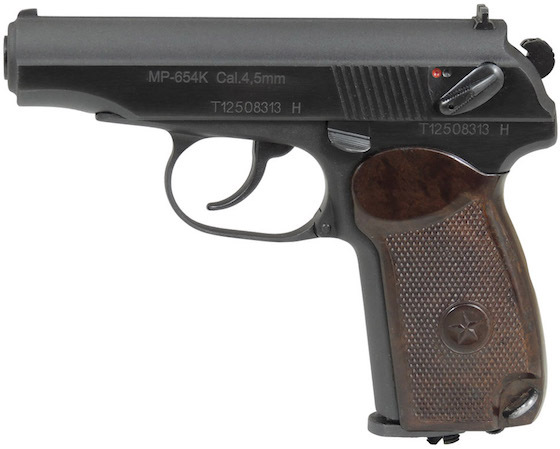 Would make an excellent training gun as it has the exact size, weight, and feel to the actual Makarov PMM (9x18) handgun. Made out of Weapons Grade Metal. If you can get your hands on one, it is sure to hold or even increase in value. No Blowback action due to it being modified from the real gun rather than made for purpose from scratch. Almost impossible to find in North America! Could be a Pro or a Con but the slide spring is crazy heavy, which makes it hard to work the slide and field strip the gun. 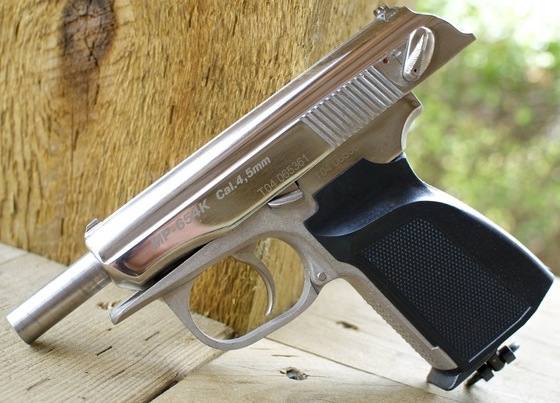 The Baikal MP-654K BB Air pistol is a treasure to own, it is unique in that it is derived from the actual Makarov side by side in the original factory in Russia. 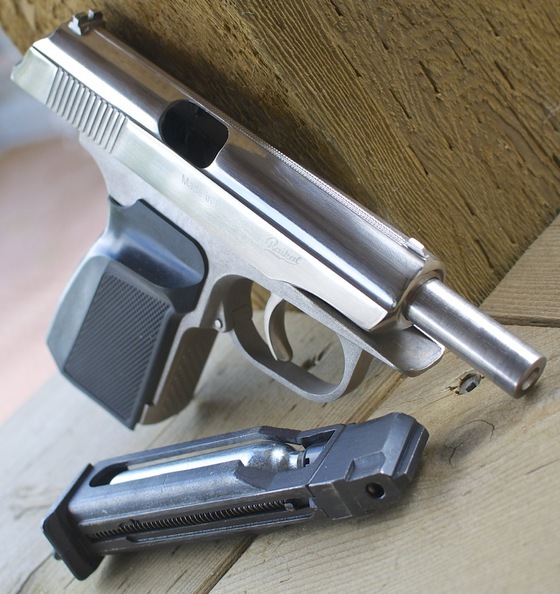 Most Air guns are designed from scratch and therefore usually only look like the guns they replicate but internally they are usually nothing alike. 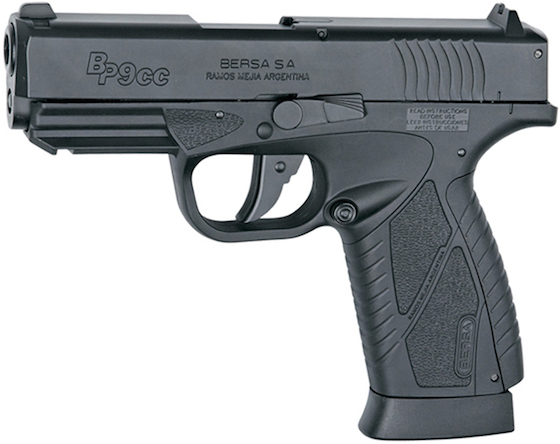 The Baikal MP-654K BB Gun is the real Makarov with a few changes to allow it to shoot BB's propelled by CO2. 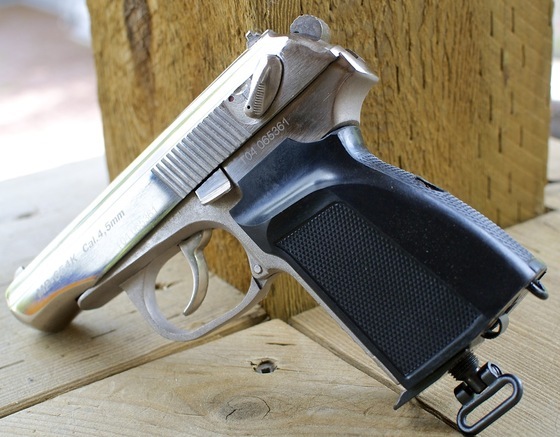 If you're a replica Airgun collector and you ever have the chance to pick one up, do it!